The large MPV segment is boosted by new arrivals in Q3 of 2015, as the segment is up a still modest 2,2% in the third quarter, reducing its year-to-date loss to “just” 13%, from -19% in the first half. The near future of the segment looks relatively bright, considering the all-new Renault Espace is still getting up to speed and the new generations Ford Galaxy and S-Max will reach full potential in 2016 as well. For now the Volkswagen Sharan keeps the lead of the segment, ahead of its corporate clone Seat Alhambra with a combined 57,7% share of the segment (down from 61,5% in the first half), but in September the Ford S-Max was boosted by a traditionally strong month of September, its 2nd biggest market, to lead the segment ahead of the Espace, with the Sharan surprisingly in fourth place behind the Alhambra as well. A very dynamic segment indeed, although the two current leaders are too far ahead to be threatened for their positions by the end of the year, but the Espace and S-Max will have a fierce battle for the bottom spot of the podium. And in 2016, expect to find those two leading the ranking, with the Galaxy a good third, kicking the VW-Group twins off the segment podium. 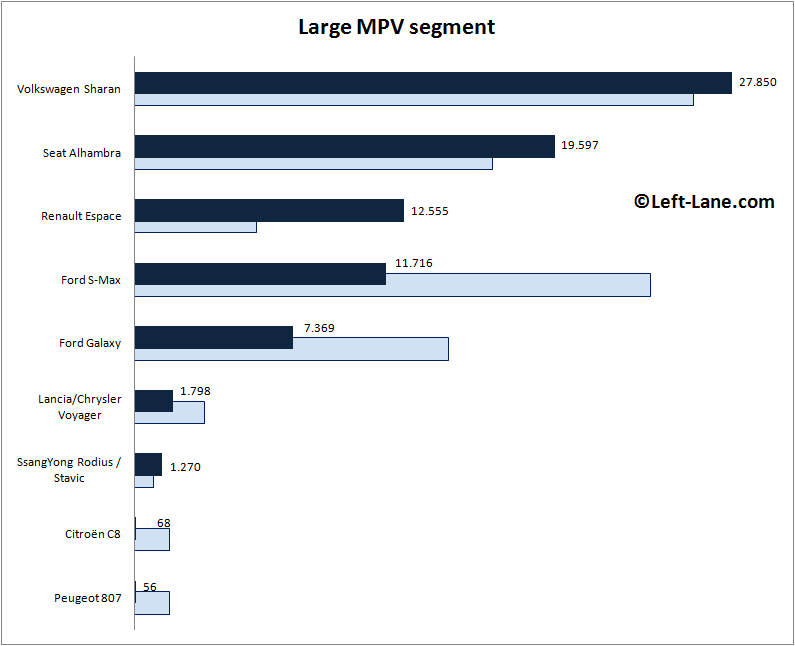 And basically, these five models that already hold a combined 96,1% share of the segment will be the only ones that sell in significant numbers next year, as the PSA twins Citroën C8 and Peugeot 807 have finally been officially put out of their misery, while the Lancia Voyager (only 3 Chrysler Voyagers are sold in the UK per month on average) was outsold even by the SsangYong Rodius in Q3. Also check out the 2015-H1 Minivan segment in the United States. Good to see the new Espace making a great entrance. Renault, again, dared to be different and it pays off. In their own way, SsangYong does the same thing. The Rodius is the only 11-seater in this segment and it’s nice to see this gets rewarded by more people. The Rodius is indeed available as an 11-seater in various Asian markets, but as far as I know, in Europe you can get it with 8 seats tops. In Europe the legal number of pasengers of any vehicle with the car license, is 9. For more passengers, you must to obtain a different driving license.